Here are some handy code snippets that will be useful while working with HTML Tables. Now write some code that highlights a cell if the employee’s age is > 50. The selector $("#someTable td.age") selects all td’s with the class age.Using .filter() we reduce the set of matched age cells to those cells that have a value greater than 50. We are using parseInt() first to convert the text in each age cell, to a number, and then comparing to see if the text is greater than 50. The class ‘highlite’ highlights all age cells which has a value > 50, by changing the color of the matching cell, to bold green. If you observe, the parseInt function has two arguments: a required numeric string, and an optional radix (base). The radix is the number’s base, as in base-8 (octal), base-10 (decimal) and base-16 (hexadecimal). If the radix is not provided, it’s assumed to be 10, for decimal. Although the second argument is optional, it’s considered a good practice to always provide it explicitly. Save and browse the file in your browser and the Age cell in the 3rd row gets highlighted. parent() gets the parent of each age cell in the current set of matched elements. Since the parent of the cell is a row, the entire row gets highlighted. You must be wondering why we are getting the count as 6 rows, when the table contains only 5 rows. We get 6 rows as the <thead> also has a <tr>. To get the correct count, simply change the selector from $("#someTable") to $("#someTable tbody") which will now select only rows inside the tbody. From the clicked tr element, we navigate up to the row via closest(), and then find the cell (td) using find(). The map() method is useful in getting the value of a collection of td’s. 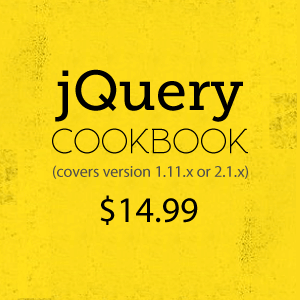 Since the return value is a jQuery object (which contains an array) we use get() on the result to work with the array. Save and browse the file in a browser. Open the browser console window and click on any row to view the values of all the cells in that row. We start by getting the zero-based position of the clicked ‘td’ element in the idx variable. Then navigate up to the tbody via closest(), get the immediately preceding sibling and find() the th. siblings of the clicked 'td' element. Then filter those siblings for 'th' elements and use eq() supplying it an index to match the ‘th’, with that of the cell that was clicked. The final step is to retrieve the text of that element using text(). 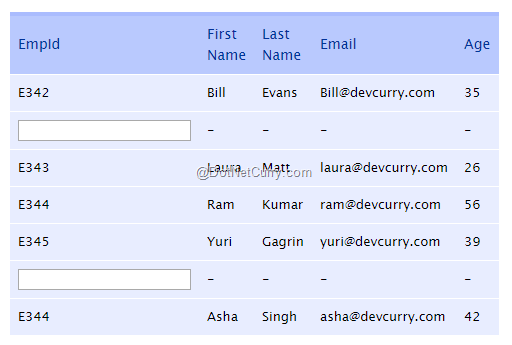 Observe how we have chained multiple jQuery functions to achieve our requirement. I clicked on a cell containing ‘Ram’, 26 and E345. Open the console window of your browser to see the output.